People have asked what pattern I used for my first afghan and my simple reply is none. It's a technique not a pattern. A kit was sold years ago through Herrschners to get the technique instructions with all the yarn needed to make an afghan, but, they have been contacted before. They do not sell the afghan and it is not copy righted. I was actually taught through word of mouth how to do this technique, it's what got me interested in crocheting. 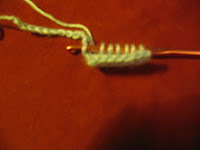 Insert hook in second chain from hook, yarn over and pull up a loop. Now insert in next chain, yarn over and pull up a loop. Repeat this 4 more times until you have 7 loops on your hook. 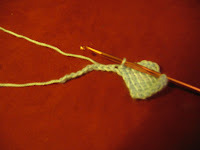 Yarn over and pull through 2 loops on the hook, you will have now 6 loops left on your hook . Yarn over and pull through 2 loops on hook, you now have 5 loops on hook. 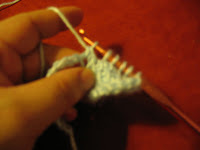 Yarn over and pull through 2 loops on hook, you now have 4 loops left on hook. 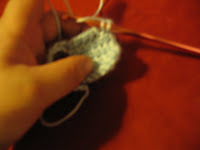 Yarn over and pull through 2 loops on hook, you will now have 3 loops left on hook. 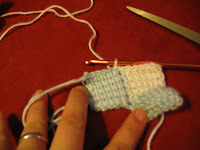 Yarn over and pull through 2 loops on hook, you will now have 2 loops left on hook. 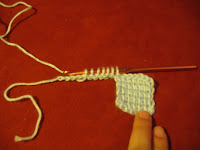 Yarn over and pull through 2 loops on hook, you will have one remaining loop on hook. This is the basic Tunisian Simple Stitch or TSS, see not so scary or hard to achieve and I promise after even a pram cover in this stitch you'll get really good at gauge. The individual diamonds are small though so keep going as gauge isn't a huge concern for this project and it will come to you. Also, given the texture TSS creates the blanket becomes busy and you don't notice changes in gauge or mistakes very easily. Now look at the work. You should see it looks different then regular crochet work. 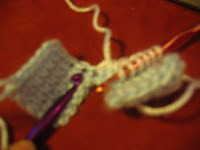 There are vertical bars visible on the front of the stitch comprised of just one strand of yarn. 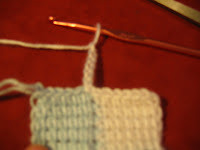 You want to insert your hook under this bar, yarn over and pull up a loop. Repeat this across until you have 6 loops on the hook. You want to repeat step 4, 3 more times. You should be able to look at the diamond formed and see 5 vertical bars running from side to side, as well 5 vertical bars from top to bottom. It gets very easy to count rows worked in TSS. 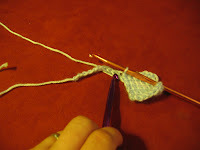 Since Tunisian is related to Knitting similar terms are used. If you do knit you will be able to see the similarities in techniques between the two. Now to bind off, you have one loop on your hook. 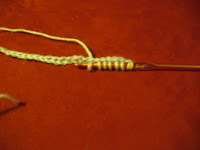 Place hook under next vertical bar, yarn over and pull through, now pull that through the 1st loop you had on the hook as well as if completing a slip stitch. Do this across 5 times, when you get to the corner you want to insert hook in same chain as the last stitch was made, yarn over and ss to bind off. You have completed your first diamond! 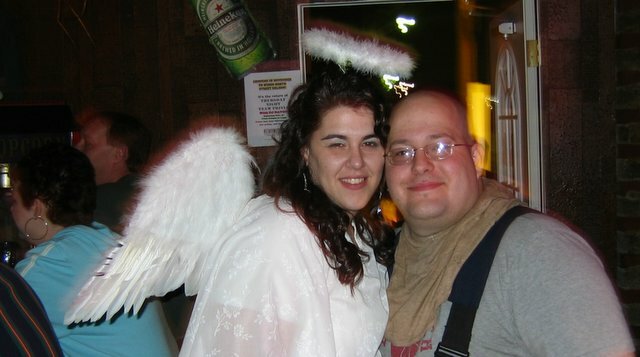 You can see in this image I am pointing to the next unworked chain. Insert hook into this unworked chain, yarn over and pull up a loop. Repeat this 5 more times until you have 7 loops on the hook. Now you simply repeat step 3 working off the loops. Keep going repeating steps 2-5. When you get to step 5, binding off and you are at the last stitch, insert hook in the one last remaining unworked chain ss and fasten off. You have completed your foundation row of diamonds! 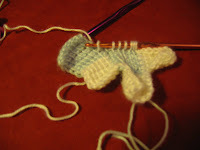 You want to attach your yarn into the upper corner of one of the diamonds. I suggest doing this to the diamond on your right if you were to lay the piece out flat in front of you. You have many options here as well, there are no rules. You can now make each round a different color or the same color, you can make each diamond a different color (though you'll have a massive amount of ends to weave in) you get to decide. 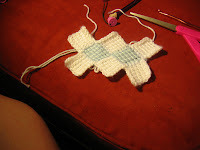 Here I used baby blue for the foundation row and switched to white for the second row of diamonds. Now work the TSS across utilizing the vertical bar on the diamond from the first row of diamonds. Work until you have 6 loops on the hook. When you get to the next diamond insert your hook into the corner where the 2 diamonds on the first round meet. 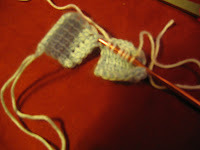 Yarn over and pull up a loop, then complete step 3, working off the loops. 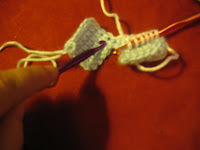 You are going to continue this for 4 more rows, when you place the 7th loop on the hook you will be going into the next row of diamonds on the foundation row, yarn over, pull up a loop and then working off the stitches. 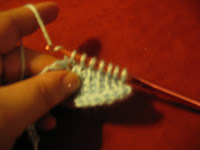 Complete the bind off from step 5 and you have added your first diamond to the second row of diamonds. Now you are at the corner of your piece as you see in the image just above. You need to create a foundation row of chains to be able to work the TSS. This will now be a combination of how you worked the TSS on the base chain as well as how you worked the last diamond you just completed. 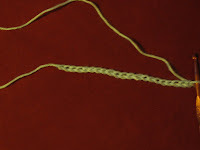 Insert hook into2nd chain from hook, pull up a loop and go across repeating the TSS until you have 6 loops on the hook. Now you will insert the hook into the corner where the blue and white are meeting in this above image. Yarn over, pull up a loop then repeat step 3 to work loops off. Now repeat step 7 until you have formed another diamond. You have completed your second diamond and worked a corner. When you get to the bind off on the last diamond, ss into the corner to join it to the bottom corner of the very first diamond you made and then fasten off. You have now completed the second round. You will continue adding round after round in the same manner until the afghan is the size you desire. For a pram cover I work the foundation of diamonds then 10 more rounds of diamonds. You have the flexibility to chose how many though you will see the afghan grow. At the very end you may chose to do a sc around the edge to control some minor curling you will get from the Tunisian stitch. After laundering the curling eases up a bit but will always be there if you don't sc. I prefer to hold the wrong side to me and sc around, I find this controls the curl the best instead of holding the afghan right side to me and sc around. This is not a stash buster per say. As the afghan grows you will require larger and larger amounts of yarn for each round. If you have 1-2 skeins of a color you can work a round in it, but, I really prefer to have all the yarn I would like to begin with, you don't want to be working on the 20th round of diamonds, get 1/2 way around and then run out of yarn if you intent was to make that whole round in one color. You will literally be ripping out thousands of stitches at that point. I don't use cotton or wool, I find this is best for acrylic yarns. The fabric created is very dense! A twin sized afghan is warmer then most down blankets I own If you're taking a trip to the Arctic circle, wool may be for you, however, you will find even on the coldest winter day it would be too much. As for 100% cotton, well being so dense the laundering of an afghan in cotton would be impossible in a regular machine, it's far to heavy and when wet actually broke one of my machine belts (learned from trial and error), also the texture created I don't find lends itself well to cotton over the long run. It works alright on a pram cover and possibly crib sized afghan but on a larger afghan the cotton starts to untwist with wear and tear. These take awhile to make even for fast crocheters. This was the first thing I ever learned to crochet so in the beginning a twin sized afghan took me about 1100 hrs to complete. I then went on and made many more before going insane because I knew no other stitch or how to read a pattern. Now, years later, crocheting much faster, a twin takes me about 400-500 hrs to complete. That would be about 2 months, working at this for 8 hrs a day. It's well worth the effort, but, don't get dismayed. In the beginning it will go fast as the first few rounds don't have many diamonds, as you go along and you have say 150 diamonds to complete in one round, it takes longer to do then the second round where you had 6 diamonds. It will finish eventually and the nice thing about the unique edge created is that you can really stop where ever you like and keep the full effect. Any questions leave a comment or email me and I'll help the best I can. I have been thinking of making another myself. If anyone wants to be part of a CAL (crochet a long) please leave a comment, if there's enough interest I'll start one. Thats an awsome description, there is a very similar thing to this with normal crochet only you do DCs into the chain and work up the first DC of the last square to make the side of the next.. (bad description) but because they are DCs it ends up with it making a hole, it grows stupidly fast and the holes do look OK, but, this is far more what I hoped to see from it.. I shall trythis! Thanks for the great tutorial. I linked here from crochet partners and couldn't sleep until I got the "gist" of this pattern. It was easy thanks to your instructions. 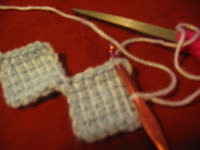 I am wondering if this technique could be modified to do clothing like I have seen with the knitted squares. I do not have an original pattern nor have I seen an original pattern I have been told about the Herschners kit as well as seen a letter received by a friend that they hold no copyright on this technique as well as a letter stating she was free to copy and distirbute the pattern with the kit if she wanted to. I do not have a copy though and what I described in this post doesn't actually follow what the Herschnners kit did. My last update on this subject. I have now seen the original Herschnners Kit pattern by Caron , it's actually not the same pattern. I am writing them myself as well to ask if they feel this post infringes on anything in their eyes, but, according to a lawyer it does not. I got as far as you did in the pictures, but when it came for the second round I found it hard to work out where to start, either I would crochet with existing peices right and below, or, left and above, either way, I dont see how to add like that.. Any help? Im trying this out and Ive got as far as your pictures have, but when I come to do the third round, Im finding Im unsure where to start, Im faced with either the existing diamonds on the right and bottom which is hard to work with, or left and top which is also hard.. Can you tell me where Im going wrong? Step 7 shows how to add the 2nd row and all rounds after that. You basically will just shove the hook into the outside corner of one of the diamonds. to attach the yarn, just like when you attach to a sc. Then you use the vertical bars on the diamond you just attached to. when you go to attach for the 2nd round and all further rounds place the diamonds down in front of you and chose one on the top right to attach to so the worked piece is to the bottom and left of where you begin. Ive run into the same problem the anonymous person did. Im looking at the end of my first full round (eg not the starter squares) and so far it looks great, but, looking at it now, to maintain the going in opposite directions part for each square, Im faced with borders bottom and right or left and top by pre-existing squares. If I had the existing work on the border bottom and left, I would be continuing the previous diamond and it wouldnt look right. Ok I think I may know what you mean now. When you do a round after the starter blocks and you get to adding the corner piece were you have to once again chain 6 and create a new diamond, the vertical bars change direction. This does happen through out the blanket. This happens because you turn the work to work in the round and is part of the design of entralac in the round. This is why I suggest starting on an interior diamond and not trying to start off on one of the very corner diamonds. Just keep following the technique each round. Eventually if you do a tight stitch or one color you will notice triangle forming, over all this isn't very noticeable though. I have a picture up of the texture on entralac2007.blogspot.com which shows you how the vertical bars change direction. You can click on the image to enlarge it. You will see the diamonds on the right the vertical bars go from bottom right to top left. If you look up at the left you will see the vertical bars run from bottom left to top right. This is how entralac in the round works so you can turn the corner so to speak. Oh my gosh I think I love you! 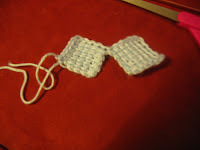 I have been drooling over the knitted entralac and you have a crocheted method! Thanks so much for the tut! Thank you SO MUCH for posting this tutorial. I do entrelac often and love it but have had difficulty figuring out how to do it in the round. Great instructions! I personally leave my edges and just do a sc boarder to help fight any curl because most afghans have a straight edge so this makes them kind of unique. But, if you want to do a fill in diamond you need to go around the afghan again like to do the basic squares, but on the nd and subsequent rows decrease one at the beginning of each row and it will fill in that space with a diamond instead of a square leaving you with a straight edge as you finish going around. Thank you very much for this tutorial. I've been searching everywhere on the web, and I keep finding classes to pay for, but no instructions for free. I've learned all my knitting and crochet by reading instructions online, and I like to do it in the comfort of my own home. Thanks so much! This is great! A friend has been making this pattern for an afghan and she tried to show me. It is making a square afghan. She was shown how to make it but didn't have pattern. 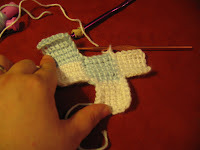 I tried but had problems making each square the same size and trouble with the ends and going around ends. This is going to help alot. Thanks. Thanks for this. I have made the herrschners one. A friend shared the pattern with me years ago and I had a blast making it. This is a bit different and I can't wait to try it out. hi buggy...this tutorial is great & i am using it to make a muffler (scarf) for my boyfirend for valentines...using 3 colors...but i cant seem to understand how do i make straight egdes i.e. half diamonds on the sides of each row?..as each row has different color should i first make the whole lenght of the scarf & then finish each row with half diamonds..please teach me how to do this as i am very worried that i will make a scarf with zig-zag edges which might look feminine for my boyfriend...my email is shuchi90210@hotmail.com...eagerly awaiting your reply..thanks! They say you can't teach and old dog new tricks. We shall see! I am 80 years old. I saw a baby blanket made with this stitch once and it has puzzled me for years. The person had received it as a gift and had no idea how, other than it was crochet. I have printed out your instructions. I was quite confused during the first round after the foundation because I was using more than 2 diamonds to start. I eventually realized that I had to repeat the first technique of adding a diamond until I got to the end of the row. Only then do i need to use the corner technique. Thanks for the great tutorial. I'd been searching everywhere for a way to use up some yarn from an abandonned project. This is going to be great! thank you for a great tutorial. The pictures are very helpful. thanks for posting! I took a class a couple of moths ago on this but your technique is slightly different. Thanks so much for the tutorial. I followed your link from Ravelry. Since I don't know how far I can go with the yarn I have working in a round is just perfect. thank you so very much!!!!!! I have tried and tried to get this pattern down. I found this today and am happy to say I FINALLY got it. This tutorial is very much appreciated. Thank you :) I've wanted to try this technique before but have not come across any clear instructions. Most of them start with triangles instead of diamonds and make it look confusing. I like they way you start this with diamonds instead. 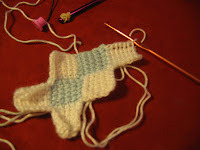 I HAVE MADE AFGHANS IN THE Tunisian STITCH BUT THIS LOOKS MORE DIFFICULT. I AM GOING TO TRY IT THOUGH. WISH ME LUCK! I discovered this style of crocheting this past winter. I have done it in knitting but I couldn't figure out how to crochet. I was sure that there was a way. I also found the crochet magazine at the fabric store and bought it on the spot. I appreciate that there are others attempting to learn it too. I made the round one first. I is queen size. I am now finishing one that has a different color for each diamond. It is in baby colors. It looks totally different from the large one that is in stripes. 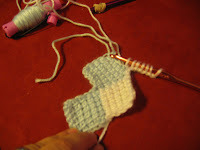 It is strange that there is so little info published on this style of crochet. If anyone wants to see finished pictures I can provide them. 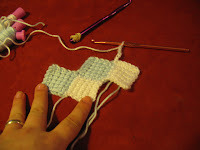 A big thank you for posting this tutorial, it's my first try at doing this entrelac and pictures do help allot.. I'll holler if I need help. I am in the process if teaching myself this pattern since I have the afghan stitch understood ( i taught that myself too!). How do I make a blanket using this type of stitch?